I totally get this, especially when I’m filleting multiple fish after a long day of fishing. I recall having to fillet 6 large Chum Salmon after a long day with an ineffective fillet knife. After that timely and frustrating process, I decided to upgrade my fillet knife. The upgraded knife has impacted the time and ease in which I’m filleting these fish. Additionally, I’ve reduced any wasted harvested meat and am very happy with the end result. In this post, I’m going to show you what to look for in a quality knife for filleting fish. Wusthof Grand Prix II German High-Carbon Stainless Steel 7"
Zwilling J.A. Henckels Twin Four Star German High-carbon Stainless Steel 7"
Bubba Blade Stiffie Stainless Steel (2mm thick) 9"
Bubba Blade Tapered Flex (7-9 Inch) Tapered Flex Stainless Steel 7"-9"
Dalstrong Gladiator Series German High-carbon Stainless Steel 7"
Rapala Fish ‘n Fillet Knife Swedish Stainless Steel 7.5"
Fillet the fish – Duh! Meaning, removes the maximum amount of meat from the bone and cartilage. Skin the fish – Skinning is the process of removing the skin or scales from the meat. Here a thin knife excels in reducing the amount of wasted meat close to the skin/scales. De-bone the fish – Removing smaller bones from the cut fillets. These are often the smaller pin bones and rib cage. Additionally, a good fillet knife will be able to cut through larger bones (e.g. spine) as well. What Length Should the Knife be? The blade length is usually aligned with the size of the fish being filleted. 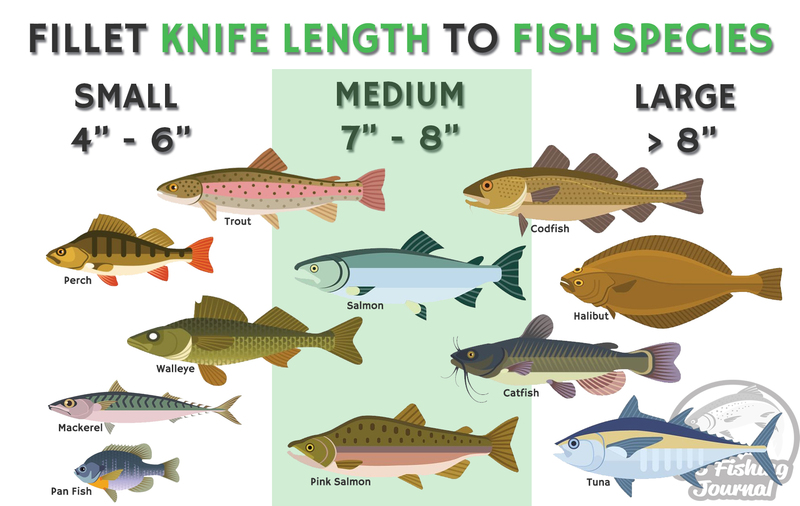 For example if you’re filleting a Crappie vs. a Salmon there are benefits to having a smaller vs. larger blade size. 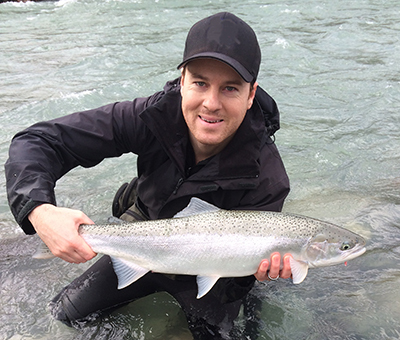 A smaller blade has a higher flexibility so is better suited for smaller fish (e.g. Crappie). Having a 9” blade for a 10” fish is not ideal. And of course the same is true on the larger fish as well. General fillet knives sizes range from 4” to 10”. However, if I had to pick one knife size to fit all it would be a medium size between 7” to 8” inches. This medium blade size will accommodate the fillet process for fish of all sizes with little difficulty. What is the Best Handle or Grip for a Fillet Knife? A good handle will provide a proper grip and comfort when in use. For obvious safety reasons and best usage it it shouldn’t slip when wet or when you’re getting the proper leverage on the knife. I would avoid knives with finger pre molds as all grips are different and more often than not these provide a worse grip for a fillet knife. I recommend a soft grip rubber which provides the best non-slip hold and ergonomic feel. Wood looks cool but can slip and sometimes over time can take on the fish smell. You may have noticed a large range of pricing between fillet knives, this is primarily based on the quality of the blade. The quality blade needs to be both flexible and made from a hard metal. Flexibility of the blade should not be overlooked as it makes your cuts more efficient as the blade can better maneuver along the backbone and pin bones. Again, giving you a better cut with less meat wasted. A hard metal ensures the blade will hold its edge (aka. sharpness). There is a Rockwell scale that defines how hard a metal is used to detail how hard a metal is. Generally speaking, the higher the number the better (harder). A higher end fillet knife will have a Rockwell scale rating between 55- 61. The lower end fillet knives are made of softer metals (e.g. carbon steel). Although these blades may offer great flexibility, they are difficult to sharpen and don’t hold their edge for very long. This often results in these blades having to be replaced every few years. The higher end fillet knives are made of stainless steel with other mixed metals that are non corrosive, provide the necessary flexibility, sharpen easily and hold their edge for a very long time. The two most common styles of fillet knives are the German (Scandinavian) style and Japanese style. They have many similarities but here are some general differences which may help you better choose the best fillet knife. For me, I prefer the German style being thicker and more rugged as I’m often doing my filleting outside in rougher conditions. The Japanese blade is better suited for precise work and attention to detail. When I’m filleting a lot of fish I’m not taking a ton of time on each one, and am not taking advantage of the thinner Japanese blade. Lastly, the thicker German blade is better fit for breaking and cutting through bones which is a pretty common for me when I’m looking to use up the entire fish for crab bait! Here are our recommended fillet knives that cover a range of price points. Read the short reviews as there is a filet knife for all types of frequency of use and for various species types/sizes. Wusthof has long had a high reputation for excellent quality knives made by skilled craftsmen in Germany. These are knives are made from a single piece of steel that is incredibly sharp with their Precision Edge Technology and with twice the edge retention (aka, does not have to be sharpened as often). Additionally, the blade has excellent flexibility and strength (Rockwell score of 58). The specially developed handle is made of polypropylene with a comfort grip and control and is resistant to holding any scents/smells. The Grand Prix 2 is a continuation of their Grand Prix series which was designed by fishermen to ensure it’s a perfect knife for all aspects of filleting fish. Simply put, this is the “Rambo” of fillet knives. If you’re looking for a rugged fillet knife to be used outdoors, in the bush, on the dock, etc, this is a great option. The Bubba Blade Stiffie is thicker (2mm) than its comparable in this review, but that’s where it gets its strength. Additionally, it doesn’t have the same flex as the other fillet knives in this guide. The handle has a trigger grip which provides an excellent hold for wet hands. The Bubba Blade Stiffie fillet knife is ideal for working with bigger game. Whether field dressing a deer or cutting up a big Tuna on the boat, this is the right knife for the job. Also, if you’re doing a lot of bone or shell cuts the leverage of the handle and thicker blade make the job much easier than standard fillet knives. Lastly, even though the blade does have that savage Rambo look and grit, it’s still incredibly sharp with a specially designed bevel edge like a sushi knife so you can still get those thinner cuts. It provides a good balance between strength and finesse as a fillet knife. The smaller brother of the Stiffie is the Bubba Blade Tapered Flex Fillet Knife. This knife is available in 7” and 9” lengths. It has many of the rugged qualities of the Stiffie but a much thinner and more flexible blade. The handle is the same with the trigger grip and its excellent hold for wet hands. The Bubba Blade flex fillet knife is ideal for making those precise thin cuts along the bone. Lastly, even though the blade does have that savage Rambo look and grit, it’s still incredibly sharp with a specially designed bevel edge like a sushi knife so you can still get those thinner cuts. It provides a good balance between strength and finesse as a fillet knife. Made from a high quality German steel with a very thin blade (1.5 mm) for quality thin cuts. The flexible blade is very maneuverable between the spine, flesh and sinew (tougher tissues between muscle and bone; tendon or ligament). The handle is made of black pakkawood which is an engineered wood & plastic material designed for rough use and wear. It’s also laminated for extra water and stain resistance. The bolster adds finger protection while providing counter weight making for a balanced and nice hold/feel. The Dalstrong knife price point is slightly lower than the knives above but still holds high quality features. If you’re on a bit of budget for a fillet knife this might be a better option. Lastly, they have a good return policy if you’re unhappy with the knife. This knife reminds me of one of the first fishing knives I had as a kid, it has that traditional look with the nostalgic birch wood handle. I would not recommend this knife for the outdoorsman who uses a fillet knife on a weekly basis as the blade steel isn’t near the quality of the blades above. This blade steel is softer so would require sharpening more frequently as it won’t hold it’s edge for long. That said, if you’re looking for a quality fillet knife for occasional usage this knife is a good value for the money. The 7.5 inch Swedish stainless steel blade is the ideal size for most sized fish. The reinforced birch varnished handle is a nice visual touch but won’t provide the same grip to plastic when it’s wet. Again for the low cost this would also make a great backup fillet knife. Here is a video outlining the best fillet techniques for Walleye, Bass, Perch, Crappie and other pan fish. With so many options and price points, a high quality fillet knife is worth the investment, especially by companies that back up their knives with a lifetime warranty. This is a big reason why I’ve recommended Wusthof’s Grand Prix II (7-Inch) fillet knife first. In order to have a quality knife each time you use it, I highly recommend investing in a quality blade up front versus buying a new blade every few years. My name is Jesse, I’ve been obsessed about fishing since I was a toddler trying to catch fish with my minnow net in any type of water. Today I have a passion to promote fishing in an educational, fun and respectful format.